Attention all DUNE HD customers! Please download the latest version and update your STB plugin! Watch 40 Ukrainian television channels online! Live Ukrainian TV and radio online, Ukrainian soccer, Ukrainian boxing and other important Ukrainian TV events live and Archived! Register now and watch Ukrainian, Russian and Polish TV online now! Also includes Russian television online package! Watch Ukrainian, Russian and Polish TV online now! Ukrainian television is the best source for news, entertainment, concerts, music and movies. Russian TV online is always fun, Russian television on line has a lot of soap operas. Now Ukrainian TV, Russian TV and Polish TV are available not only for IPTV viewers, but also online. Subscribe and watch Ukrainian and Russian television online now! When you sign up for Ukrainian Television online, you will be able to watch 40 TV channels from Ukraine that have been Archived for two weeks for the convenience of our viewers and are running. You will also get live “channel 5” and “channel 24 News” from Ukraine. 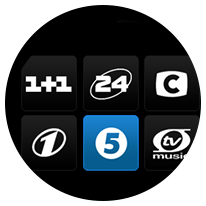 All of the Ukrainian TV online channels are broadcasting in the pilot mode and are always available to our subscribers. The purpose of the pilot project is to determine the most popular channels for broadcasting. Ukrainian TV channels are broadcasted at 900 Kbps and are guaranteed to be of the best quality you will find on the internet or any IPTV service in North America. We will also guarantee that our delayed broadcasts of Ukrainian TV online will not buffer or freeze (you must have at least 3.0 Mbps internet connection). So please sign up and enjoy your Ukrainian TV online! In our Live Events section you will find a huge section of stored Ukrainian soccer games and boxing. Also all of the Ukrainian soccer games are broadcasted to our customers LIVE and later put in to the Live Events section to be viewed on demand. IMB+ Records provides Ukrainian TV channels and live soccer online to keep our diaspora from Ukraine up to date on political news, sport events and the rest of the world. Yes, after subscribing to Ukrainian TV On line you can watch Ukrainian TV, Ukrainian TV online, time delayed Ukraine TV, time delayed Ukrainian television, Archived programs from Ukrainian television, Ukrainian news, Ukrainian movies, Ukrainian radio, Ukrainian radio online, Ukraine TV online, Ukraine politics on TV online, Ukraine television, Ukraine music, Ukrainian soccer online, Ukrainian boxing on TV online, Ukrainian sport events on TV, Ukrainian politics on TV, Ukrainian news online, Ukraine news online, Ukrainian TV shows, Ukraine TV shows, Ukrainian soap opera online, Ukrainian TV news online, Ukrainian TV shows, Ukraine soap operas online! No more satellite antennas, tuners and receivers, no need to spend money on expensive Cable Television “packages”, overpay for internet usage to find and download your favorite movies and TV series in Ukrainian or Russian. Internet TV from IMB + Records gives you a unique opportunity to connect directly to your favorite Ukrainian TV and Russian TV channels online in best quality at the lowest price in any part of the world where there is Internet access. You can watch all of the Ukrainian TV and Russian TV channels through Internet TV: IMB + Records, in excellent quality on your computer or on your TV by connecting it to your computer via HDMI. Our Ukrainian and Russian TV service easily allows you to enjoy the great quality of the picture on a 42’ screen. The only condition is stable and high speed internet with unlimited traffic. Currently our Ukrainian and Russian IPTV services using STB are available to North American customers only, but our webcasting service of Ukrainian and Russian TV through our web site is becoming available worldwide. We would be grateful for any comments and suggestions that you could send to us via the feedback form on the “Contact us” page, regarding our Ukrainian and Russian TV channels. To connect to our Ukrainian, Russian or Polish Internet TV from IMB + Records online you will need to “register” then pay for the service, and enjoy your favorite channels anywhere in the world, as long as there is access to the computer and high speed Internet. More information about our Ukrainian and Russian TV online is available on the “about us” page. All the most popular Ukrainian and Russian TV channels, a large number of films, movies, news, sports, entertainment and children’s channels of astonishing quality would be available to you during your business trip, vacation or in the comfort of your home, in LIVE and 14 day Archive on each of our channels. Now you can watch all your favorite shows, series and movies at any time convenient for you Archived for 14 days after the live broadcast. Subscribe to our service and enjoy ARCHIVE and Live Ukrainian and Russian TV online of the best quality! Copyright © IMB+Records Ltd, 2015.